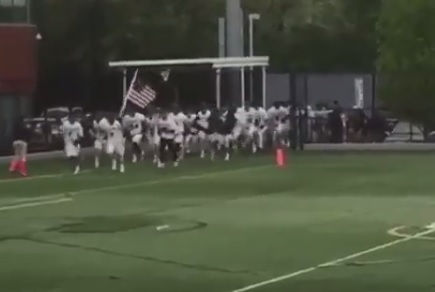 The Adelphi University men’s lacrosse team used an audio from President Trump’s speech in its entrance music this week as they entered the field for competition. The team ran on the field with the an American flag. As the team enters the field the audio plays from one of President Trump’s final campaign stops in 2016. Adelphi University is located in Long Island, New York. The men’s lacrosse team will not be allowed to use the Trump speech in the NCAA tournament this weekend. President Donald Trump’s voice will not be played Saturday when the Adelphi men’s lacrosse team takes the field for its NCAA tournament game against Pace University, a school representative said, citing NCAA tournament policy as the reason.